Notes : I substituted out the flour and just cooked the chicken with a little no salt seasoning and pepper in the oil in a separate pan. This sped up the prep of this meal by allowing the sauce and the chicken to cook at the same time, rather than waiting for the chicken to cook first. To compensate for removing the flour, I added a little bit of cornstarch that I mixed up with a little bit of water to the sauce when adding the crushed & diced tomatoes to the pan. The cornstarch is a great sub for flour when you are trying to thicken up a sauce. Review : We really enjoyed this recipe and will definitely be making again. Next time I plan on adding some carrots and trying this in the crockpot. 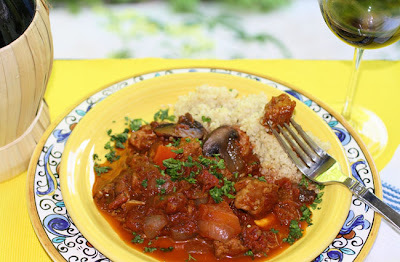 Have you ever made a cacciatore before?